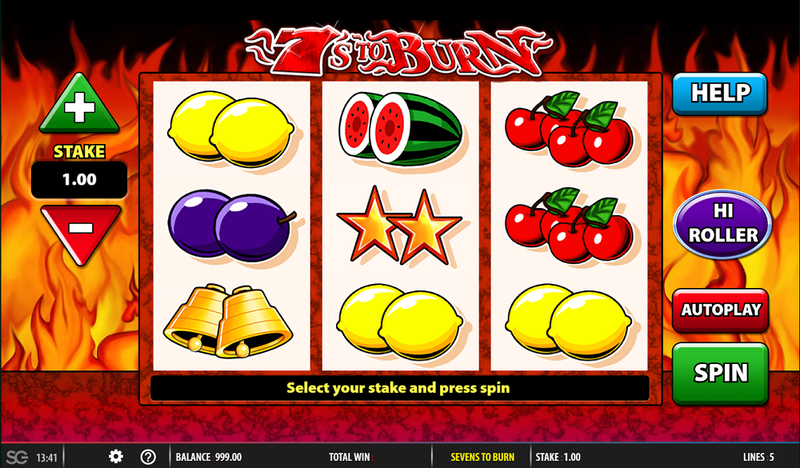 7’s To Burn is the fruity new slot game from Barcrest with a hot twist. Make sure to try out this game on Slot Shack for your chance to become a high roller and walk away with a lot of cash! If you’re feeling a little chilly then this game is sure to warm you up. The scorching flames in the background set up this game as a little more exciting than the regular fruit machine slot but it has all of the main features that you’d expect. The symbols are all traditional with the flaming 7s being the only symbol you might not recognise here. On the paytable, you’ll see all of the values of the different symbols with the flaming and regular 7s being the highest value symbols. Of course, you’ll also find some stars, bells, lemons and much more appearing on the there in traditional fruit machine style. This game is really simple but lucrative at the same time and some lucky players will be walking away with a lot of cash if they’re lucky! 7s To Burn comes with everything that you need to play on the main screen. You will be able to alter your stake depending on how much cash you have to burn and how much you want to win. The helpful buttons on the left of the reels will show you how much you can bet across the 5 paylines. Once you’re ready to go, the green spin button will get the ball rolling and you’ll start raking in your prizes. If something goes wrong or you aren’t sure about how to play, check out the help button on the right where you’ll find all of the information that you need! Wild symbols are known for switching out for any symbol except for bonus features but in this game, this is not the case. The flaming 7 is the symbol that acts as your wild, but it has some interesting properties that make it different than other games. In 7s To Burn, you’ll find that your wild will only swap out for the regular 7 symbol unless you have the high roller feature active. The high roller feature in 7s To Burn is not for the fainthearted as it comes with some extremely hot prizes but also some high stakes! If you’re feeling brave, you can go ahead and buy yourself 5 extra spins at a higher stake by pressing the purple hi roller button. If you are going to go ahead with the high roller feature then you’ll be glad to know that in this feature, the wild symbol will switch for any of the other symbols. However, this does come with a price as your payouts will only be worth half as much meaning that even though you’re winning more often, your payout will be smaller. The high roller feature is quite lucrative so make sure to look out for it when you are spinning! Join Barcrest on their latest adventure in this really exciting game. You are sure to feel the heat when you choose the high roller feature, but you could be walking away with a bundle of hot cash! Place your bets and spin on 7s To Burn today!